Rachel Littlewood previews the Autumn 2018 Fine Sale, which includes the sale of the Robin Hanbury-Tenison Newlyn School Collection of paintings, an 'Ed White' Omega Speedmaster chronograph wristwatch and an oustanding old brilliant cut diamond ring to name but a few of the varied lots on offer. A Diamond Cluster Ring (FS40/320) offered in our Two Day Fine Art Sale starting on 9th October 2018 at our salerooms in Exeter, Devon. Day One of Bearnes Hampton & Littlewood's Quarterly Fine Sale starts on Tuesday,9th October 2018 with the silver auction, where a Victorian silver Albert pattern part flatware service (FS40/47) by maker Samuel Hayne & Dudley Carter, London 1847/49 weighing 106.10ozs is inviting bids of £1,000-£1,500 and a late Victorian travelling green leather vanity case of Gladstone type by Clark, 20 Old Bond Street, London (FS40/110), containing clear glass and 9ct gold mounted bottles and jars by the maker Frederick Edmonds & Edward Johnson, London, 1890 is also being offered. With fitted compartments for brushes, notebook, sovereign holder, manicure set, blotting pad, toothbrush, button hook and other accessories, this super lot is estimated at £1,200-£1,500. Jewellery is being offered next, with a gentleman's stainless steel Omega Speedmaster 'Ed White' chronograph wristwatch (FS40/141). In 1965, Edward Higgins ('Ed White') became the first American to 'walk in space'. The Omega reference 105.003 has been coined the 'Ed White' as it was worn by White during the historic milestone in space exploration. The production of the 105.003 lasted approximately three years from 1963 and is the last of the Speedmaster's with straight lugs. 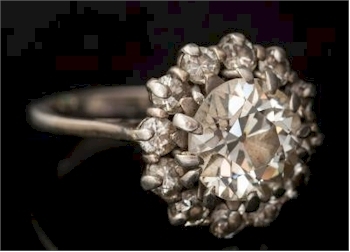 Bids of £5,000-£7,000 are invited for this, whilst a diamond cluster ring (FS40/320) with a round old brilliant cut diamond, estimated to weigh 2.7cts, is expected to fetch £6,000-£8,000. Within the paintings auction, Bearnes Hampton & Littlewood are delighted to be offering the Robin Hanbury-Tenison Newlyn School Collection of paintings. Included within this is a delightful portrait by Thomas Cooper Gotch (1854-1931) titled Patricia holding an Iris, 1917' (FS40/351), which carries a pre-sale estimate of £6,000-£8,000. There are many paintings within the collection by Thomas Cooper Gotch and also notable paintings by Dame Laura Knight, Harold Knight, and Walter Langley to name a few, as well as an oil on canvas by Samuel John Lamorna Birch (1869-1955) titled 'The Cove, Wind Blown Sea' (FS40/397), which has an estimate of £3,000-£5,000. Day Two of the auction commences with ceramics and glass auction where a beautiful pair of 'Beilby' white enamelled wine glasses (FS40/525) are inviting bids of £1,200-£1,800 and a large Goldscheider earthenware figure 'Butterfly Girl' (FS40/591), modelled after the original by Josef Lorenzyl, is estimated at £800-£1,200. An unusual item within the works of art auction of the sale is a 19th Century German double bass, circa 1880 (FS40/655) with a two piece swell back, the varnish of a medium honey brown. The pre-sale estimate for this is £4,000-£5,000, whilst a 19th Century Cantonese carved ivory pleasure junk (FS40/687) is inviting bids of £3,000-£5,000. There are several highlights within the furniture auction of the auction on Day Two and, in addition to the contents of a country house (which includes tables, chairs, beds, sideboards, console tables, etc), there are a few lots that must be mentioned separately. Firstly, a fine set of eight George III carved mahogany dining chairs in the manner of Robert Manwaring (FS40/931) from Kingsnympton Park and thence by family descent. The chairs closely relate to a design by Robert Manwaring illustrated in 'The Cabinet and Chair Makers Real Friend and Companion', 1765 and carry a pre-sale estimate of £30,000-£50,000. Secondly, is a monumental Victorian carved walnut, burr veneered and burr oak breakfront sideboard by Wolfe & Hollander Ltd (FS40/969). Measuring 229cm in length and 290cm in height, this huge piece is expected to realise £1,000-£2,000.